So... very often when I enter a gallery or looking through an art book I find myself thinking, "Well, I can do that." This is from one of those occasions. I had never used oil crayons before and I ran across a semi-local artist who used them for nature illustrations. I was inspired and thought I would give it a go. There have always been a large number of deer around my family's home in Oregon and I had a good amount of reference, so I found an image I liked and used it to create this piece. What I really wanted to focus on with this was trying to push a depth of field in a traditional piece, so I went really loose in the background and have incorporated different levels of snowflake to really push a 3 dimensional feel to the piece. 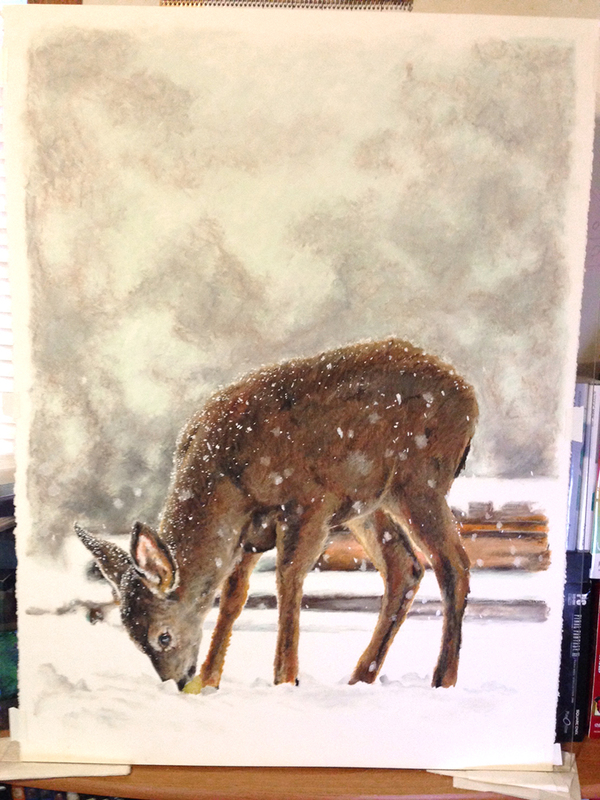 I would say it is about 70-80% done here as there is a lot of snow left to draw/paint, I need to push the shadows on the ground and I want to go back over the deer once more for just a bit more detail attention. Sorry for the camera phone quality and yellowing. When I finish I will break out my real camera, take some archival images and post a final piece both here and on my site.